You can now change the color of your car for a low price and if you want your old color back, just remove the wrap. It is also good if you want to protect your original paint job. If you are going to sell your car you can remove the wrap and the paint under will be in perfect condition. But, how much does it cost and is it really cheaper than real car paint? A car wrap does normally cost between 1500$-5000$ depending on what type of wrap you want, how much you want to wrap and the size and model of the car. The price can also differ a lot depending on which workshop you want to do the wrapping for you. 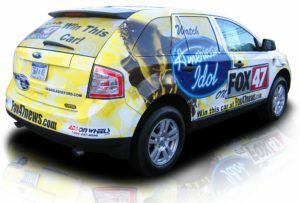 As you may suspect, the price of a car wrap can differ a lot of what car model you have and what type of wrap you want. To calculate how much a car wrap will cost for your car, we have to go through some questions to see what wrap is good for you. For a general rule, a car wrap made by a good workshop could cost between 1500$ and 5000$ or even more for special graphics wraps. You can probably find it cheaper, but if you want a trustworthy workshop to do it with a warranty, that is the most common price range. The size of the car is a big factor of how much it will cost to wrap your car. For a large vehicle, you have to use a lot more wrap than on a small one. But that is not always the case, a smaller car can be a lot harder to wrap than a large vehicle. It is depending on how your car looks and the design of it. If your car has a lot of curves it will be a lot harder to wrap than a car with a lot of flat surfaces. It could also come at an additional cost if your car has fenders and other small parts that have to be wrapped. Are you going to wrap the whole part of your car or only the hood and rood etc? Some vehicles do have black bumpers etc that does not have to be wrapped and in this cases, you will save some money. If you only want to wrap the hood and the roof, you could expect a price of around 200 – 600$. The wrap quality is one of the biggest factors for calculating a car wrapping price. Most serious workshops do only use high-quality wraps. They are often giving you a warranty on the wrap and that would not be possible if they should have been using a low-quality wrap. If you are searching for a low-cost wrap, there are several on sites like eBay and Amazon. But do not expect any good results with these cheap wraps. They are hard to apply/stretch to your vehicle and the lifetime will often be very low. If you have an old car with a worn paint with a lot of scratches and other damages, the wrap workshop will probably not give you any warranty and may give you a lower price for the workshop. Apply wrap on a bad paint will not hide the damages under, they will still be there when you are applying the wrap. Wrapping is not a way to hide old scratches and other damages. If your vehicle is already wrapped since before and you want to remove the wrap to apply a new wrap, the price will be higher. Removing a car wrap is very time-consuming and you have to remove the old wrap before you are wrapping it again. You do never put two wraps on each other. Do you want a solid, matte or metallic wrap? The solid and matte wraps are usually a lot cheaper than a metallic wrap. The choice is, of course, yours but I can really recommend to investing on a good metallic wrap, it will look like your car is painted and nobody will notice it ( Except when they open the door and see the old colour ). If you want chrome wraps you can expect costs of over 6000$ because good chrome wraps are often very expensive. Do you want a graphics wrap with some cool comics or your company’s logo? A wrap with graphics is a lot more expensive because you have to print the custom wrap out for your car and it’s slightly harder to apply it to your vehicle. But yes I agree that some graphics wraps could be really awesome! The prices do of course depends on who you want to do the job for you. You could leave it to a small workshop that does not give you any guarantee and you will get a very cheap wrap, but you will probably get the results after the price. I have seen a lot of bad wraps that was made by cheap workshops. Do not do that, if you are going to wrap your car, I recommend you to go to a larger well-known workshop that will give you a warranty on the wrap. It will be worth the price. Can I wrap my car myself at home? I get a lot of questions about how hard it is to wrap your car at home. Car wrapping is really hard to get a good result for yourself if you are not willing to put some time into it. If you are handy and are willing to spend some time on how to learn to wrap a car it is possible to get a good result ( I Have done it myself ). If you want to learn how to wrap your car at home, I recommend you to check a lot of youtube videos of tips & tricks about how to wrap your car to get the best results the first time. Expect that you will waste a lot of wrap at pieces that did not go well. But with some training, you can wrap your car yourself at home ( And maybe start your own wrap workshop after some practice ). Always make sure to clean all parts of your car carefully before you are starting to wrap your car. If you really want to wrap your car yourself at home, you can check out this youtube video and the following. Can I buy the wrap myself and bring it to a workshop? Many workshops do not really allow you to do this. They do often use high-quality wraps and have learned to wrap with them. Low-quality wraps can take a lot more time to wrap with and that’s why they often only want to wrap with their own wrap. But it never hurts to ask, some smaller wrap workshops can probably do it for you. But do not expect to get a warranty of the wrapping and maybe bad results if the wrap is cheap and bad. The discussion about a wrap or a paint job is hot and it is not possible to say “Which is the best”. It is depending on what goals you want to achieve. A wrap is easy to remove if you do not want that colour anymore. A wrap is also good to protect the original paint when you are removing the wrap. It’s easy to rewrap only a part if you get any damages. It is often also cheaper to do a car wrap instead of a paint job. The downsides of the wrapping as it will not look as good as a good paint job. The parts inside your doors and under your hood etc will still be the original paint. If you are choosing a bad wrap quality the lifetime will not be very long. If you are going to wrap your car, spend your money on good high-quality wrap and a good workshop to wrap for you. Small defects will appear very good behind the wrap. You can wrap your car yourself at home if you spend some time researching and learning how to do it. If you have any other questions about car wrapping or want to tell your story about car wrapping, comment down below. If you have any other car questions you are welcome to ask us at our homepage.